Ron and Cliff had a Sunday wedding. 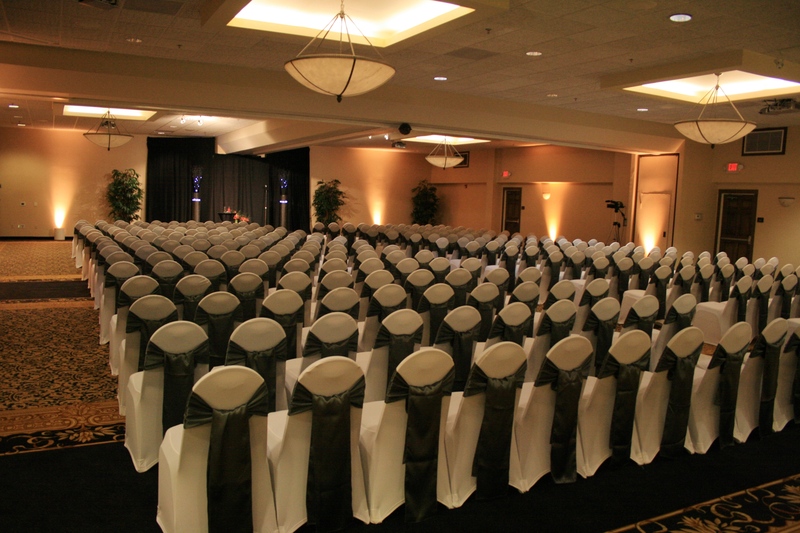 Their ceremony took place at the Hilton, as well. We began playing music as guests entered around 5:00. 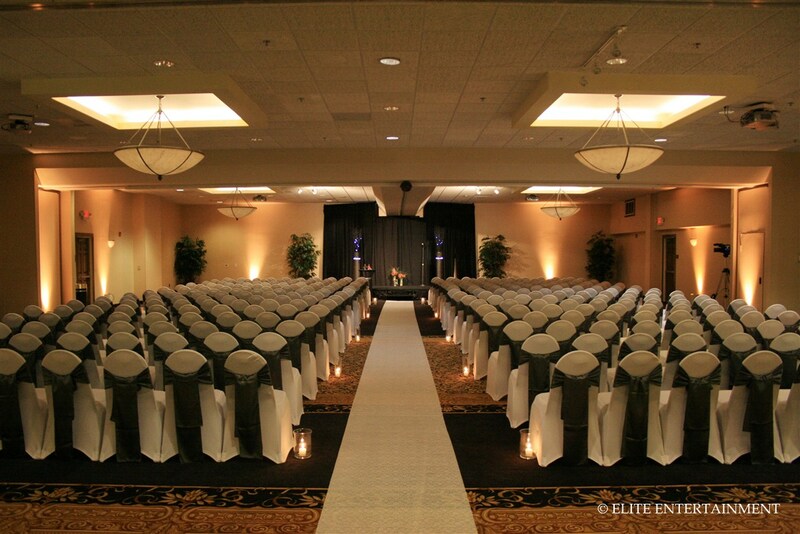 We thought the candle-light along the aisle was a beautiful touch for an evening ceremony. We also uplighted the room with amber glow. They were looking for a masculine look, so they chose our white stretch chair covers with charcoal sashes in a foldover tie rather than a bow. 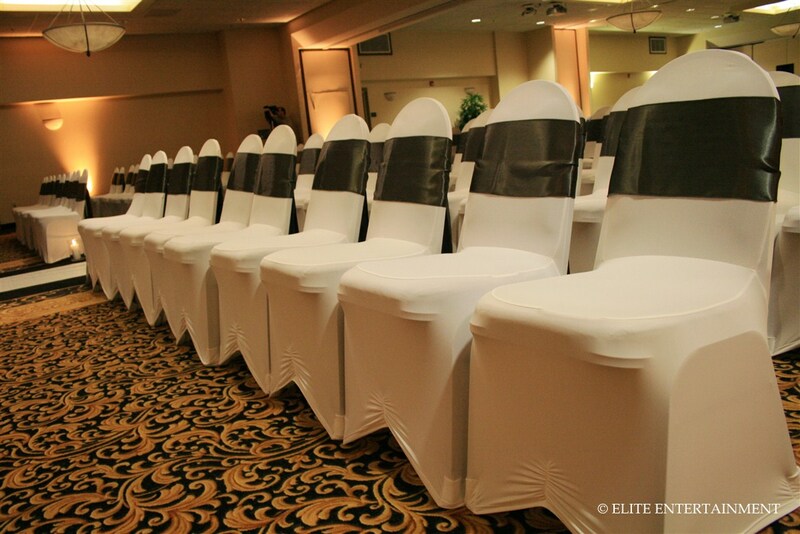 These chair covers are very sleek and modern. We love that they maintain their look throughout the night nomatter how much they get moved around. After the ceremony, guests were asked to proceed into the reception. 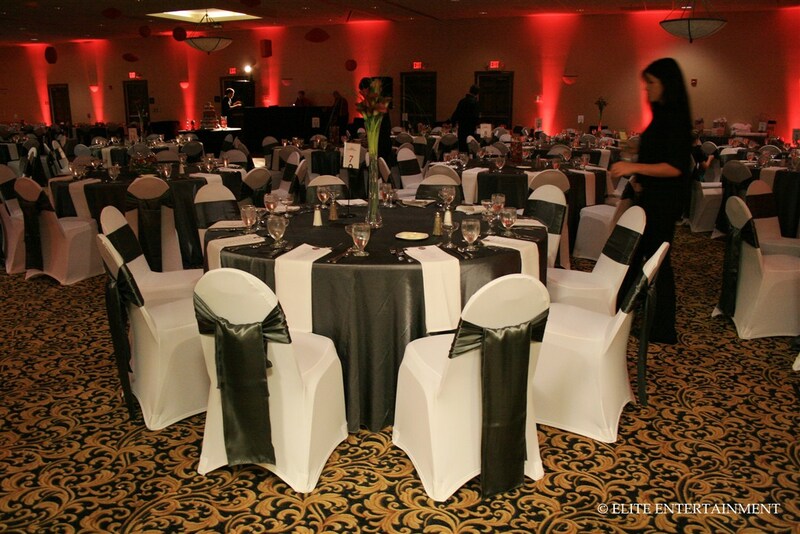 The same chairs were paired with charcoal satin tablecloths. Then, they had simple red floral centerpieces to give the tables a punch of color. Red was also used for their uplighting. Each table had personalized “Buffet and Music Menus.” Cliff and Ron had categorized each block of music with titles like “Mushy Love Songs,” “Hooray for Bollywood,” “Break It Down,” etc. It was a neat touch! ~ by Elite Entertainment on July 8, 2011. This entry was posted on July 8, 2011 at 8:12 am and is filed under Hilton.You can follow any responses to this entry through the RSS 2.0 feed.You can leave a response, or trackback from your own site.